Slurs, note extensions, chords, pick-up measures, first and second endings, and page layout. Open a new file. 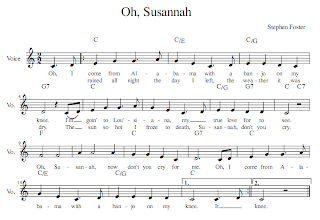 The song name is “Oh, Susannah”, and the composer is Stephen Foster. Create a new file from scratch. The time signature for this piece is 2/2. Click on the box that says “Pick up measure”, and adjust the settings to say “1/2”. There are 17 measures. Step 1. Enter the notes into the score. Remember that to make a note dotted, you need to type a period (.) before entering the note. Remember that you can always undo a mistake by typing “ctrl+Z”. Redo an action by typing “ctrl+Y”. Step 2. Enter the lyrics. 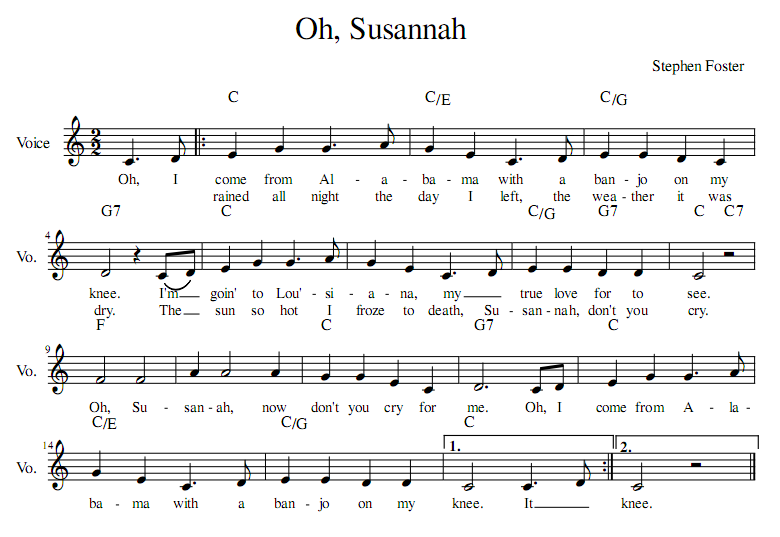 Press “n” to get out of note-entry mode, click on the first note of the score, and type “ctrl+L” enter the lyrics mode. Type the words in. When you get to “I’m” right after “Banjo on my knee”, we want to create a note extension. Do this by typing an underscore (_) for the eighth-note “d”. There are four times in the lyrics that you will have to do this. Step 3. Adding a slur. In the fourth measure, we want to add a note slur for the word “I’m”. Do this by clicking on “Lines” on the side palette. It’s the seventh one down. Click and drag the slur to the middle C, and let go when it is highlighted (turns red). Step 4. While you are there, add the first ending to measure 16, and a second ending to measure 17. Do this by dragging the symbol to the measure and letting go when the whole measure is highlighted. Step 5. Repeats Symbols. Add repeats by clicking on the “Barlines” tab on the side palette. You need a forward repeat sign for the first whole measure, and a backwards repeat sign in measure 16. Step 6. Adding chord symbols. Click on the first note and type “ctrl+K”. This will let you enter text above the staff for your chords. Type “C” over the “E” in the first whole measure. Skip on by hitting the space bar. In measure two, type “C/E”. Continue through the score and add all of the chords. Note: This is a function that liked more in the Finale program. During playback, it would play these chords for you. This is a feature that has been requested several times to the Musescore developers, and may be included in a near update. I’m crossing my fingers for this feature! You’re done! There is one more thing that I did with this assignment as I was playing with the layout. On the top tab, click on “Layout”. Click on “page settings”. The default page size is A4. In the states, we usually print on “Letter” sized paper (8 ½” by 11”). I selected this and clicked “apply”. It changed the formatting around a little bit to make the page wider. Yes, Musescore is great, and they have translated it into several different languages. Opensource is fantastic! Thank you for sharing!